Here is my cat Ragamuffin who has thought up a clever use for my fabric and pattern stash. 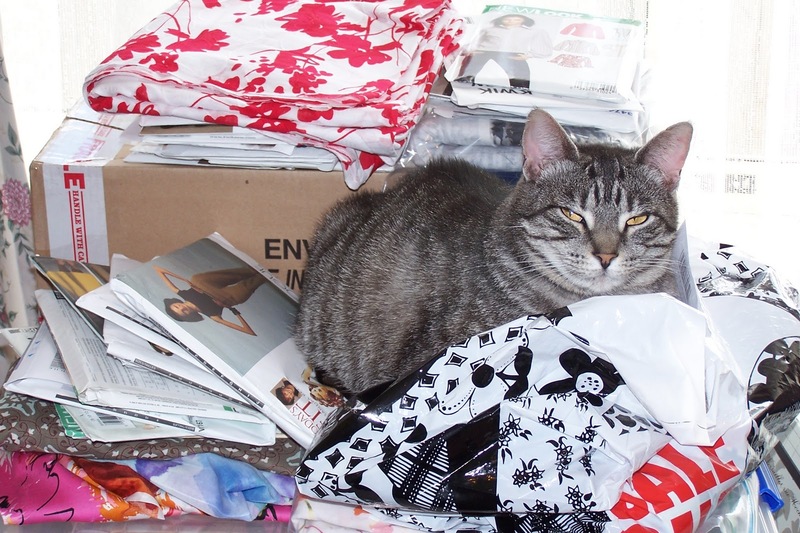 She is sitting on top of some pants patterns that I pulled out to look at and some recent fabric purchases; you can just make out the word sale on one of the bags. I was ironing up the sleeve hems on my green watercolour fabric top, and when I turned around to go over to the sewing machine, there she was. It will not be a permanent sleeping spot for her, I can assure you (and her) of that. At my sewing club recently, one of the members said that she is sewing in just the colour mauve for the next 12 months. What a clever idea! Even if she sewed mauve clothes for six months and then did a matching colour for the next 6 months, she could not fail to have things that went with each other. She brought in a brightly coloured tshirt dress in predominantly mauve print with several complementary colours. She had also made a dress in a solid mauve colour. What a great idea, and something to ponder for my wardrobe sewing. I have finished the watercolour fabric top, and might have pictures for you tomorrow. How satisfying it is to finish something that works out well. Next up is my attempt at pants making. Yikes! I would prefer to be making the Liberty fabric up, but I need some summer pants in natural cool fibres. How Did You Learn to Sew Clothes?